Let me introduce the tone of the game by quoting the very first dialog box in the game: “This wood is freaking bleak…. But, I gotta fine count’s castle. Then can kill him as well!! !” That, quite possibly, is the greatest line ever spoken by man. SlashMaster is a sidescroller beat-em-up style game with upgradable combo attacks where you beat up goblins, zombies, and strange boss monsters. SlashMaster is from Zoobox on the iPhone and iPod for $0.99. First of all, the dialog has to be on purpose. At least, I hope so. I’ll consider the entire dialog as satire on the “All your base are belong to us” infamy. SlashMaster’s story is an extremely simple one, and the strangely “translated” dialog works well to set up the quirky tone. Every line of dialog, even the description in the AppStore pretty much have this style going for it… it really makes me worried that this wasn’t intentional. Art in SlashMaster is nice and well done. All the backgrounds have cartoonish proportions, colorings, and shadows. Characters are done in 3D and they look great. 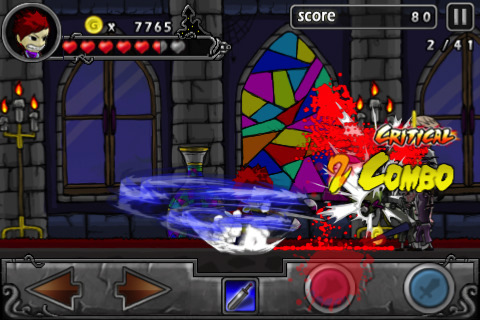 Bosses all have completely different appearances and particle effects from your attacks are bright and very colorful. The music is pretty repetitive, but good quality overall. The boss battle music is this heavy metal track that is actually pretty awesome. Overall, Zoobox did a nice job with this badly translated anime parody. The meat and potatoes of the game is the combat. You attack and jump with two standard buttons at the bottom of the screen. Of course, with many new games, the jump button is never on the outside like the old Mario games or classic platformers. I just have the habit of moving my thumb away from the screen to jump and moving it towards the screen to attack or do anything else. Minor issue though. The movement controls are pretty stiff, with only a left and right button that will constantly get locked. I don’t know how, but sometimes the buttons will stay activated as if you were holding it. It’s usually fixed by tapping the locked button, but it has gotten me beaten several times due to my character constantly running to the right and smacking into a fireball or something. There is a very nice leveling system. It’s a simple system for 3 weapons, each level up requiring money to purchase. The level ups add one attack to a specific weapon or increasing the power of a single attack. There is a fast but weaker sword, a strong but slower claymore, and a long range but stationary gun. Each one has their uses, though I find the Claymore sword extremely useful since if you jump and attack at the same time, you’ll attack instantly with full damage. 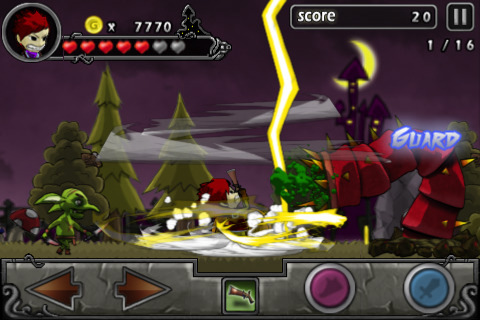 AppSafari review of SlashMaster was written by Joseph Ho on September 30th, 2010 and categorized under App Store, Beat-em Up, Games. Page viewed 3161 times, 1 so far today. Need help on using these apps? Please read the Help Page.